"Drill bit set - countersink 5 piece" has been added to your cart. 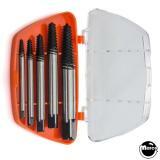 5 piece Titanium countersink bit set. Great aid for installing flat head screws. Sizes: 1/4", 3/8", 1/2", 5/8", 3/4"